When I realized that we did not have a Basic Chocolate Cupcake recipe anywhere on Caramel Potatoes; I knew I had to fix that right away. 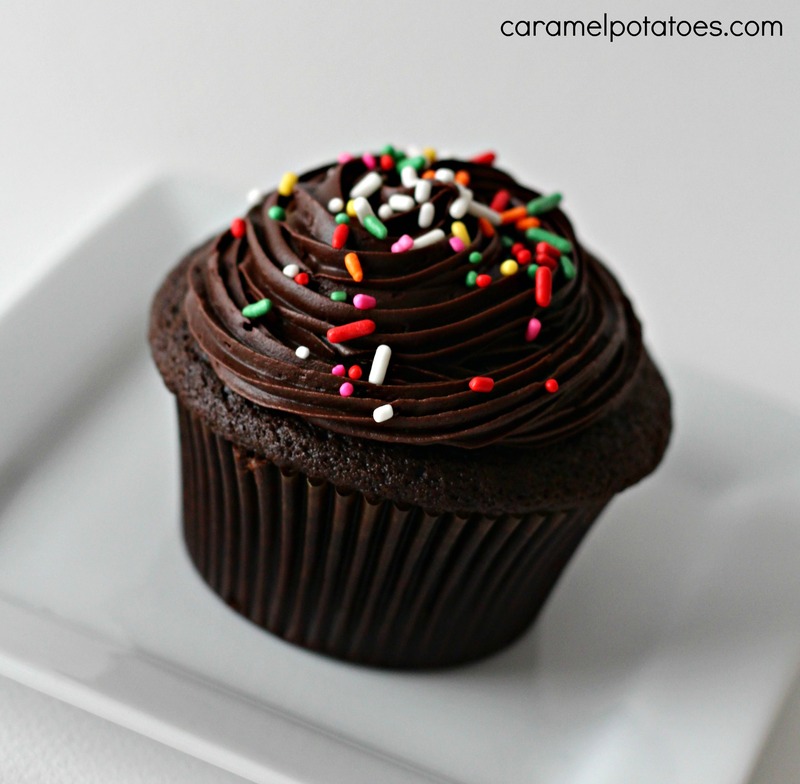 This is really a good basic Chocolate Cupcake recipe that is perfect for any occasion. We are going to use two types of chocolate to make sure we have some depth and richness of course. We don’t want a boring cupcake after all, do we? It is the Super Bowl (GO BRONCOS!!) on Sunday so if you are looking for a fun and simple way to serve some cupcakes; look no farther. 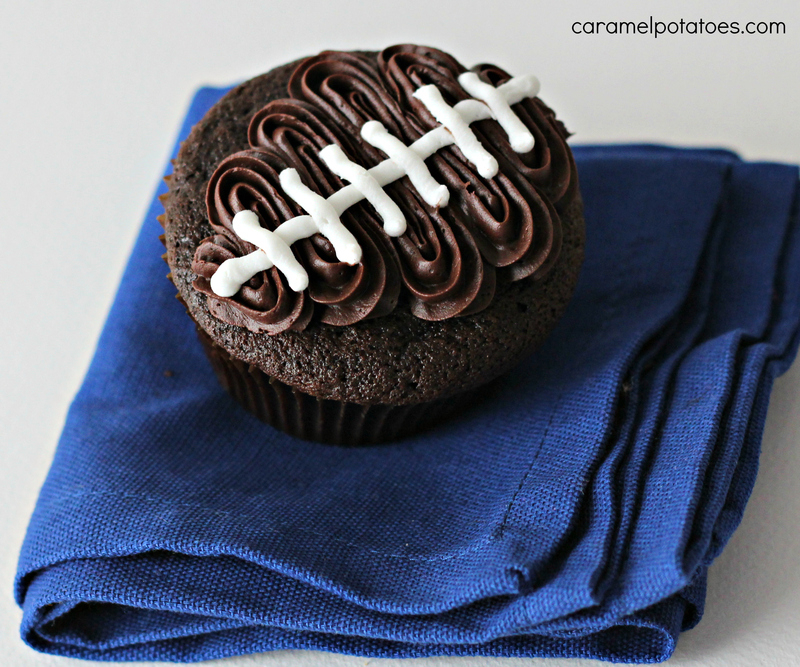 Simply frost your cupcakes like footballs. I promise it is so easy! All I did was use a small start tip with chocolate frosting to zig zag in a diamond shape, or football shape. Then just use a small round tip with white frosting to draw the lines on. That’s it. It really doesn’t take long and is a fun way to celebrate the Super Bowl this Sunday. Preheat oven to 350. Line a standard size muffin pan with cupcake wrappers. Place the cocoa powder and chocolate chips in a large mixing bowl. Pour the hot water over the top and whisk until smooth. Place in the refrigerator until cool, about 10-20 minutes. Meanwhile, whisk together the sugar, flour, baking soda and salt in a medium bowl and set aside. Once the chocolate mixture has cooled; whisk in the oil, vinegar, eggs and vanilla until smooth. Add the flour mixture and whisk until smooth. Divide the batter evenly between the 12 muffin pan cups. Bake until cupcakes are set, about 18-21 minutes; or until a toothpick inserted in the center comes out clean. Cool cupcakes in the pan for about 10 minutes, before removing to a wire rack to cool completely. Of course what’s a chocolate cupcake without a great Chocolate Frosting?